Balzer + Bray, 9780062685155, 320pp. Olugbemisola Rhuday-Perkovich is the author of the middle grade novels Two Naomis and Naomis Too, as well as 8th Grade Superzero. She has contributed to the website Brightly and the books Open Mic: Riffs on Life Between Cultures in Ten Voices and Break These Rules: 35 YA Authors on Speaking Up, Standing Out, and Being Yourself. She enjoys showing her leadership skills to her younger sister and wishes you could eat cake in the library. She lives with her family in New York City, where she writes, makes things, and needs to get more sleep. Olugbemisola loves to visit with readers and writers like you; until then, find her online at www.olugbemisolabooks.com. Audrey Vernick is the author of more than a dozen books for young readers, including Is Your Buffalo Ready For Kindergarten? and She Loved Baseball: The Effa Manley Story. 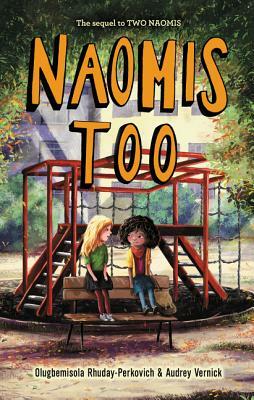 She is also the coauthor of the middle grade novels Two Naomis and Naomis Too. Audrey enjoys visiting schools to speak with young readers and writers. She lives with her family near the ocean in New Jersey. Visit her online at www.audreyvernick.com.